Yoga for Football Conditioning? Sounds fascinating, doesn’t it? A few years ago putting the words “yoga” and “football” in the same sentence would’ve been unheard of…silly…get out of here! What’s wrong with you?? Now, since so many professionals (Ray Lewis, Russell Wilson, Vernon Davis, Victor Cruz and even Lebron James) swear by it, yoga has shot to the spotlight in the ever going effort to keep athletes strong, flexible, durable, focused and balanced. 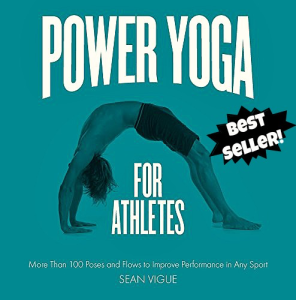 The reason I wrote my Yoga for Athletes manual was to give every athlete easy access to the performance improving benefits of this classic and life changing discipline. The words “easy access” ring in my head frequently as I’m able to practice and film my own yoga routines anywhere from my garage to the top of a mountain (literally, I live in the Colorado Rockies!). There is no denying the delightful potency of how available yoga and it’s tremendous mental and physical benefits are to everyone. I highly recommend you also add my Pilates for Athletes to your daily training too. Yoga and Pilates combined is a truly DANGEROUS union! 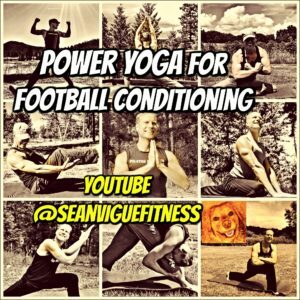 Below is my 3 part series: Power Yoga for Football Conditioning. Each workout is complete, challenging and perfect for ANY athlete who wishes to build strength, endurance, flexibility, focus, recovery time, speed and balance. I invite you to “check in” below each video, subscribe to never miss a workout and share it with your coaches and teammates (snap and send your photos to SeanVigueFitness@gmail.com) to get everyone on my yoga program…before your rival does! Once you finish this challenge you’re ready to move onto my popular FULL 7 Day Yoga Challenge. I use the FitStyleCo Yoga Mat. Click here for yours. Use code 7X97-8KHQ69-XZZE2Z for 20% off. Click the photo below to add my Pilates for Athletes to your training! 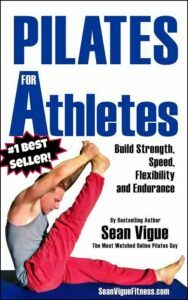 Train like an olympian with my yoga and Pilates programs. This is an amazing series Coach!